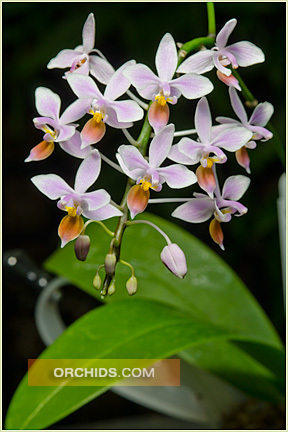 Definitely the most charming and sought-after of all Phalaenopsis species ! Sequential flowers are produced on compact branching spikes over a compact leaf span. As seen in the picture, it readily produces keikis (baby plants) on its flower spikes, the flowers producing a light fragrance during the day. Can easily grow to specimen size with multiple spikes, giving the effect of a little bush of soft pink flowers. A must for any species lover !.